Well, even though the age rating is for kids 6-8, I would recommend this for all ages. It works for drawing any and everything, from complex sketches all the way down to random doodles. Now that I have addressed the good things about this app, let me address some issues. The app crashes. It only happens occasionally, but it sometimes just crashes when you are drawing and when you reopen the app, it didn't save the drawing you were working on. I find this a minor inconvenience. But if you can be patient with that, this app is for you. Only downside is it only gives you two coloring books for starters, and hose coloring books are for babies. Any coloring books for adults you will have to buy. I don't like that. But hey, it's a nice drawing app and all the drawing tools are free! I’d probably learn to live with my large iPhone since iPhone 6L - and now 8L - is almost in the same size range. But they don’t offer Drawing Pad! It just a year or so ago that I discovered the value of using a Photo Image as wallpaper and my work was a second layer completely blend-able with the wallpaper (or “over” the wallpaper) which can be covered but not changed without changing the wallpaper. A bit hard to explain, but the latitude it offers in photo-shopping is my preference over the preferred method. I’ve used this app for years, and I still find it limitless. User friendly and overall great app!! I’ve got no problem paying a dollar here and there for add ones, and what I really love.......NO MONTHLY OR YEARLY SUBSCRIPTIONS!! Lots of colors to use, how wide or narrow you want the tool you use, brushes, pencils, everything in one app. Thank you!! I love this app and it is so much better than they advertise it to be!!! Only one complaint: I can’t download it on my phone! I love the style of this design, how everything looks real. You know what the tools do, unlike pricey apps with obscure interfaces. I love the backgrounds/borders! However, this lacks funtionality because it won't import from other apps or icloud. I drew pictures in other apps I want to color with this one. Importing from photos is a privacy risk and doesn't support layers. Please add support for at least three layers. Importing from anywhere should be able to turned off in options (to stop kids from messing something up.) Add Spilt-view for multitasking (could also be turned off.) Keep compatible with ios 10 so not to lose 32bit customers. I'm trying to make a medieval map. Plesse add stickers for castle, king/princess, old house, old walled city, dragon, Chinese dragon, troll/other monster. There's currently no house-cat sticker? Many people hate/fear bugs. Put an option in to hide bugs in drawer, or better, let us hide all stickers we don't want to scroll through every time. Add a pet coloring book with dogs, cats, ponies, ferrets, birds, and lizards. Thanks for your work :). Okay, I'm gonna make this short and simple. So, people said that this app downloads way too slow. Well, I have a solution. Plug it into your charger and it will go faster...at least that's what mine did. Hope that helped! Remember, if u ever need help, just say in your review "blue fish help" and I will answer your question/problem as good as I possibly can. You're welcome! Best drawing, doodling and painting app available. So worth the money! Hours of fun!!!! I love this app, but you must disable in-app purchasing! Very young children can get stuck toggling through the bookstore. Lesson learned, and the people at Drawling PAD were great about helping me fix the problem, but I've changed my settings for the future. Thank you for this excellent app! I know it already takes a lot of space in memory, but here's my wish-list: 1. Floating Palette access buttons might be in the upper corners or moveable. 2. It takes a lot of effort to get a pencil, or other stylus to have just the qualities one desires. It would be very useful if you could have a second drawer where one could save one's favorite tools, tweaked and saved to one's specifications. 3. As an academically trained artist, I use all the traditional media, it would be wonderful if you could also offer a crow-quill pen, and a variety of colors (I like a raw umber-y sepia, like Pelikan's), and in the floating palette, a selection of washes (light and watery, light medium, medium, dark medium, and dark), each becoming less transparent as they get darker. (Think Tiepolo drawings). 4. Reproductions of hand-made drawing papers: like the now extinct Barcham-Green papers, like Charter Oak or Boxley Hot Press, Maidenstone. Others still being made like Lana Laid, or Sennelier's blue-grey paper which artists have used since 1835 or so. 5. Or create an app specifically for fine artists. I realize how versatile the app is as it is, but making a strictly fine arts version--because it has such great potential--would economize the memory space it uses. THANKS SO MUCH for this really beautiful app. This is the best drawing app so far, and the price is so reasonable!!! thank you soooo much! This app is very easy to use. Really lets me bring out my artistic side. My kids really enjoy using it as well. Hey, people who read this along with hopefully someone who updates this app. Well, the problems are one, you should be able to save colors to a color pallet or something. Two, you should fix the undo buttons because sometimes it deletes your progress if pressed. And third, you should add more colors for chalk, pencil, and paint, and also add like a spray paint tool, along with sponge and melted crayon. The good things are from here on out. I love that you could make your own colors, along with a blending tool. Also the variety of colored pencils. I like the rainbow colors added too. The background option is a nice add. Please consider the first paragraph. And thanks for my favorite drawing app! This app never let's me down! My little brother lost his baseball game and I went strait to this app and said,"Great job Cole!" And he was so happy!!!🙏🙏🙏🙏🙏🙏🙏🙏🙏🙏🙏🙏🙏🙏🙏😘😉☺️😊😀😃😄😜😝😛😆😋😎!!! Well worth the money. Hours of creative entertainment. I looked for a drawing app for a while and finally settled on Drawing Pad. We have used it with our preschool - 4th graders for over a year now and we all love it. Very intuitive for kids to use, multiple drawing tools, stamps, typing, and you can save and go back to projects to work on again. Was so happy to have update to take care of stamp glitchiness after upgrade to iOS7. The only thing that would make it better is to add a paint bucket, and maybe more stamps! I used to have tons of drawings saved to the album until the app crashed and everything was deleted. Also when you press the back arrow sometimes it erases the whole drawing. Variety of Tools to Choose From! This app is very easy to use and I like all the tool options. I think this app could be used for a variety of purposes across multiple age levels. When I saw "offers in app purchases" I thought it would make you buy everything like the apple app like this does. But it gives you a lot more utensils and such to draw that I thought it would! Buy this app! $1.99 is like an amazing deal for this. That's what my Grandkids said. This app is great for all ages. I find it useful for personalizing pictures. My 4 Grandkids (2 - 10 yrs) love it! I really like this app but when I use the smudging tool, it has a really long reaction time. This is my second iPad and third iPhone; I've invested in thousands of apps. I saw this app used by artist Kyle Lambert on utube. I liked the tool box, and other realistic features. So there I was well progressed on an amazing portrait sketch when it crashed. Annoyed, but patient (it is just a digital sketch after all), I chalked it up to perhaps being a minor quirk somewhere. i reset and started over. Nearly complete and it crashed again! When my third sketch attempt crashed I was Done. I won't use it again until this problem is fixed. I have all the fancy, complicated drawing for myself. Bought this for my 5 yo grandson because my apps are too difficult for him (and sometimes for me). I love this app...I must confess I have been using it a lot! Very user friendly, not just for kids, I even think playing with the coloring books is pretty cool. I would say best of drawing apps for non professionals! It’s okay, but it could definitely be better. I’m more of a fancier artist, but not fancy enough to get an app that requires a subscription fee. The app that I had previously used was perfect! But then, it stopped working, so I had to get rid of it, then it left the American App Store, so I came to this. I got used to the nicer features of that app, like layers, and I was pretty devastated when I lost it. I know this is for a younger age range, and 6-year-olds likely won’t use layer, but it would be a nice addition. At least 3 layers, that have a merge option. I know this is definitely a lot more work for you, but it may make you a bit more money. Maybe, spend less time on making the tools look realistic, and put your efforts elsewhere. This app is awesome for drawing but it seriously need a bucket tool because it's really annoying to have to fill an object in and then re-outline it , please add this, it deserves 5 stars but it's just missing this :). On a Saturday morning, my daughter asks me if I know how to fix an issue she is running into with Drawing Pad. She wants to save her drawing to the camera roll so that she can export to iMovie. I'm already pretty excited that she is engaged with something creative on her iPad, so I am eager to help. I emailed support after attempting to resolve the error myself. The developer replied to me within an hour and supplied a swift resolution to the issue. Thank you and well done! This app is good because,there's a lot of tools. You can make many creations! You should buy this app! Your undo/redo bug that was 'fixed' is NOT! Just lost most of the work I did. Please FIX it this time! I really like this app.its a great app and it does save your work.i saw a review that said that it didn't save there work but it does! !you have to look for the Art album.its also a great app becouse it has shade and those are the ones that was looking for..Anyway I think that this is a really neat app and an exradinary one! I have been using this app for 3 years now. It's still the best app I know. When a kid loses the drawing she's been working on for weeks, it's time for a new app. Very disappointed with Drawing Pad. I had a concern into how this app interacted with my email, iBooks, Twitter and Facebook apps. Customer support responded quickly, clearly and included a link to a video to help me understand how it works. I really do like this app a lot. I think it's great. It has more features than I expected. This is a fun and easy app use, give it a try! Awesome. The only thing I'd like to see is a indicator of which tool I've selected. Either put a little icon somewhere or make the selection stand out some how. I haven't figured out how to make shapes yet, this would be useful. Thanks for the wonderful app! My kids love it! And so do I!!! One request can you add princess stickers please. Thank you.!!! This App Is The BEST APP EVER! I love how you can make it look like watercolor! You can make your own colors! It is👌 EXCEPT FOR ☝️THING! You should be able to save the colors you make. But other than that it's 👌 and 👍 and ❤️. It's a great drawing app but it does this thing where it gets super fuzzy after awhile and the undo button is still broken. I like that I actually get to color with this app. I pick my colors and use my finger and away I go. Very therapeutic. BUT, I would really like some better coloring books options. More intricate designs and not so childish versions. That would make this a five star app! I am going to fess up here. I'm an adult and I love to doodle and PRETEND I can draw. Sadly, I have zero drawing talent. Anyway, I've tried lots of coloring apps over the years and this is by FAR the very best drawing/coloring app of its kind that I have ever seen and used! I LOVE that you can choose to use crayons, colored pencils, markers (some VERY cool markers too), as well as paint brushes. There are LOTS of colors to choose from and you can even create your own colors! I appreciate that the coloring books can be individually purchased at a reasonable price. In the past you had to buy multiple apps to combine all these features. Bummer! Only 2-3 days of using this app, I too experienced a crash and total deletion of my current work. I think it has something to do with the "undo" button. I hit it a couple of times rapidly and my work disappeared then reappeared but the next time I used the undo button everything was lost on my current project and the app froze for a bit. The game is good but it starts over half of my drawings and is so annoying please fix in your next update. My three, six, eight, and ten year grandchildren all love it. I use it for fun, drawing Halloween costume designs, and less serious art. David Hockney has a wonderful body of work done on an iPad platform. Highly recommend this. It is so easy to use, and there are so many choices for colors and brushes, pens, markers, etc. there are also stickers and stuff, backgrounds, and you can use your own pictures as backgrounds, too! If you are looking for a good drawing app, get this one. I keep getting this error when trying to save my artwork: "Error: Image was not saved". Please fix this problem and I will update this review. Thanks. The undo button... I am tired of having completely start over. Whenever I open the application and decide to continue on a previous project, if I tap the screen it will make a smudge. So I 'undo' the action, only to have it revert to a white sheet again. Very frustrating... Having to do the same draw THREE times. Decent drawing app, but it looks very outdated and childish, not matching the look of other apps updated for iOS 7/8. Time for an update. Whenever I go to finish a drawing in my saved file something always goes wrong! If I mess up on something and click the redo arrow, it always removes about half of the drawing! It's an amazing app but it makes it difficult to love when your work is always destroyed. This is one of my favorite apps for students. Our SK-8th grade students use it for a variety of subject areas including illustrating math problems and their own stories. Tons of tools, stickers and backgrounds add to students’ work. Easy to use, exports to camera roll so photos can be used in any other app! One of my 5 must have apps for iPad integration! I like drawing. I had this app since I owned an iPad, so I can say I think very highly of it. There are better apps, but there is always something better. I found this glitch where you hit the redo button and your work is deleted. Fix it, and you get five stars from me. This is a must have for kids. Better yet, for kids who cant communicate verbally, its a blessing in disguise. I used this app 24/7 for my anime work! Then as I would draw alot then i hit the back button, ALL GONE! Everything! So fix this or I want my money back!!!! Everything I've ever drawn disappeared from my album. Beware of this app - find something more reliable. Beyond bummed by this. I LOVE drawing pad, but when I insert a picture into the paper, and make it so I can draw on it, I can't zoom in! Other than that, you go Murtha Design Incorporated!! This app is great mobile art studio app for all ages of children 2-92. It is easy and fun to use. It has many types of tools to choose from. There are paint brushes, crayons, colored pencils, markers and more. There are ways to enhance and fine tune the mark that each of these tools makes. There are many selections for colors. The pencils, for instance, had 68 colors to choose from, which could also be modified into the tints or shades of these colors. This app provides a platform for fun open-ended creativity. It also has coloring books for those who like that. It has nice save and undo features. 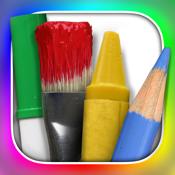 This app is a must have for helping children explore open ended art creativity. It's kind of good to draw on, but it could use more dazzle! Crashes and won't run with the new iOS. I love this app, BUT I AM FURIOUS BECAUSE I WORKED ON A DRAWING FOR TWO WHOLE MONTHS AND WHEN I HIT THE UNDO BUTTON, MOST OF THE DRAWING UNDID ITSELF. I AM BEYOND APPALLED. I CANNOT BELIEVE IT. I AM UTTERLY BAFFLED. FIX THIS GLITCH PLEASE!!! Title says it all. We use it to send custom e-cards all the time. This app has great features, however; it doesn't save your work. I have worked on a drawing for 3 weeks. Today, when I opened the app and did minor touch up work it was working fine. Then, I hit the back button one time and it erased all the work I previously worked on for the past week. Don't waste your money on this app, there are way better ones that will actually SAVE your work. It's sad you have to pay for this app and this has happened to me several times. Complete Garbage. How can you do wonderful art with a app that erases your work. I'll probably be 60 by the time I will be able to finish this drawing that erases half my work! Please fix this bug, until then; your app is going on the cloud. I suggest everyone to do the same! Download this app for hours of enjoyment!!! I love it! I wanted a sketch pad app and not to have to monkey around with layers and this fit the bill and more. The entire family loves using it to draw, doodle and to color in the coloring pages. Very easy to use. Tons of brush options - I feel like we discover a new tool, brush or color each week. No lost work yet. A long time ago when I was super little, I had this SUPER old iPad that I had this game on and this app was everything to me. I had multiple years of drawings saved on it, and one day my little sister got mad at me and deleted the app.... It deleted all my work and I cried for hours😂😁😖😬😭 What I am trying to say is that this app is amazing DEFINETLY DOWNLOAD!!!!!! I am super sad that you can not download on an iPhone 😭😭😭😭😭😭😭😭PLEASE MAKE A IPHONE VERSION!!!!!!!!!!! THANK YOU! !